Philadelphia band Dr. Dog and New Jersey duo Saint Rich have teamed up for both an extensive US tour and a very special collaborative recording. The two bands have released a four song EP together via the free download site Noise Trade. The EP contains four tracks. Each band covered each other and there is a song from each respective band’s own record. Dr Dog recorded a version of Saint Rich’s song Dreams from their record Beyond the Drone. Saint Rich in turn interpreted the song Rock & Roll from Dr Dog’s album B-Room. In addition the EP contains Dr Dog’s Phenomenon from B-Room and Saint Rich’s Crying From the Home from Beyond the Drone. Dr. Dog’s Zach Miller explains the band’s unique process on their cover: “Every track was recorded in a different state. We didn’t have a lot of time to get together on this one so we recorded our own tracks at home and sent them to Scott in Connecticut. 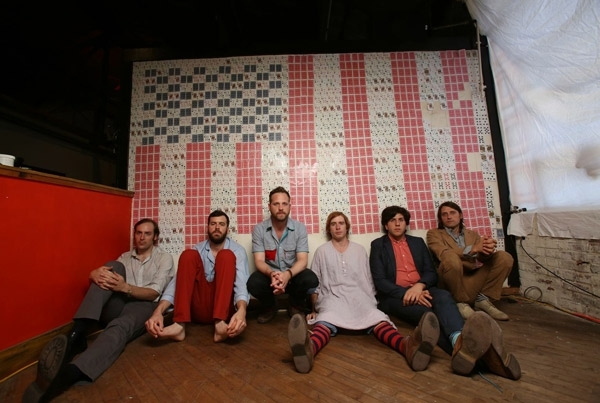 You can sample and download the Dr. Dog and Saint Rich’s Casual Freefall Tour EP at Noise Trade. Dr. Dog released a collection of four delightfully weird and heartfelt original Christmas songs yesterday. The EP is entitled Oh My Christmas Tree and was initially intended as a gift to the band’s family and friends. Fortunately for the rest of us, the group has decided to make the songs public. And thanks to the fine folks at Slate Magazine you can listen to them here. In keeping with the holiday spirit, 100% of artist proceeds from this digital only benefit EP will be donated to Feeding America, the nationwide network of food banks that feeds more than 37 million people including nearly 14 million children and leads the nation in the fight against hunger. As Dr. Dog’s Scott McMicken explains: “Last year, in 2012, I wrote these songs and recorded them in two different kitchens over the course of the two weeks leading up to Christmas. I made them with the intent to mail them to some of my friends and family as a Christmas present. It wound up being a great gift to myself. “The experience definitely showed me once again that stopping to pay closer attention to what things mean, even seemingly familiar things, always brings an added depth and beauty to life. And always in a surprising way. For more information on Feeding America and how to help, go to: www.feedingamerica.org . To order the EP go to https://itunes.apple.com/us/album/oh-my-christmas-tree-ep/id767992747. On October 1 Dr. Dog released their highly anticipated new album B-Room which RollingStone.com is currently streaming offering listeners a chance to hear the record in its entirety. In addition the site is featuring an interview with the band who have just announced a new series of 2014 live dates. The previous months have been a time of enthusiastic construction for Dr. Dog. First they built a new recording studio in an old mill and then set about assembling a supremely soulful new album in B–Room which delightfully mines and expands upon the surrounding landscape of Philadelphia soul. The tracks on B-Room were captured primarily live in-studio. As a result the rollicking groove and beloved musical interchange which has been delighting live audiences resonates throughout the disc. B-Room is a wonderful album that offers you everything. There’s soul, rock, pop and ballads among many more genres. Not one song sounds the same and at times, the songs don’t even sound like the same band is performing them. Dr. Dog manage to sound completely different in every song on B-Room making it an album that you will never get bored of listening to. Track one The Truth starts with a pumping drum beat which is gradually accompanied by a string melody and keyboard. The song is calming with its slow stuttered guitar riffs and soft vocals. However, previous release Broken Heart spices the record up instantly. It’s a track that has a danceable beat. The chorus, “She really loved him/But I couldn’t see it though/He really loved her/But I don’t believe it oh no” is catchy with the music’s fast tempo and quickly sung lyrics adding to the lively nature of this track. Minding The Usher brings in slightly Jimi Hendrix inspired soulful guitar riffs against a backdrop of deep bass and soft drums. The vocals sound entirely different from the previous tracks making it hard to recognise this track as part of the same album but this is what makes it so fantastic to listen to. Phenomenon introduces some country into B-Room. The banjo plays at the beginning with the drums and fiddles slowly kicking in. This song has a great rhythm and melody that will leave it floating around in your head long after you listen to it. After Phenomenon’s upbeat colourful explosion on B-Room comes Too Weak To Ramble, the first ballad on Dr. Dog’s newest album. The vocals intensify all the emotions that the lyrics help to portray. The verse, “Too weak to try/Too drunk to stay up/Too grown to lie/I always told myself I would make it harder here alive/But I’m too weak to ramble” shows true emotion being expressed through the strained, almost tearful vocals. Cuckoo, on the other hand, sounds like its sauntered straight out of the 70s – this sort of authentic, old rock sound isn’t always pulled off very successfully but Dr. Dog are an exception. Cuckoo has soulful rock vocals that resemble Jimi Hendrix and guitar riffs, drum rhythms and harmonies that place this song snugly in the 70s where it belongs. The harmonies resemble those of Neil Young in Cowgirl In The Sand and Southern Man. The AV Club has recently premiered a new lyric video for the song Love from B-Room. The new video combines footage from vintage toy commercials with the song’s bittersweet lyrics. Love is a beautiful modern love song with the chorus’ lyrics, “Love can it/Last all my life/As it passes…” highlighting this. Dr. Dog have produced a more than perfect album in B-Room. There isn’t a song that doesn’t live up to your expectations of this band. B-Room is a superb record and by far one of the best released in 2013. It’s a true triumph from musical genii.